13cm bear with golden coloured soft fur, black beaded eyes and brown embroidered nose. 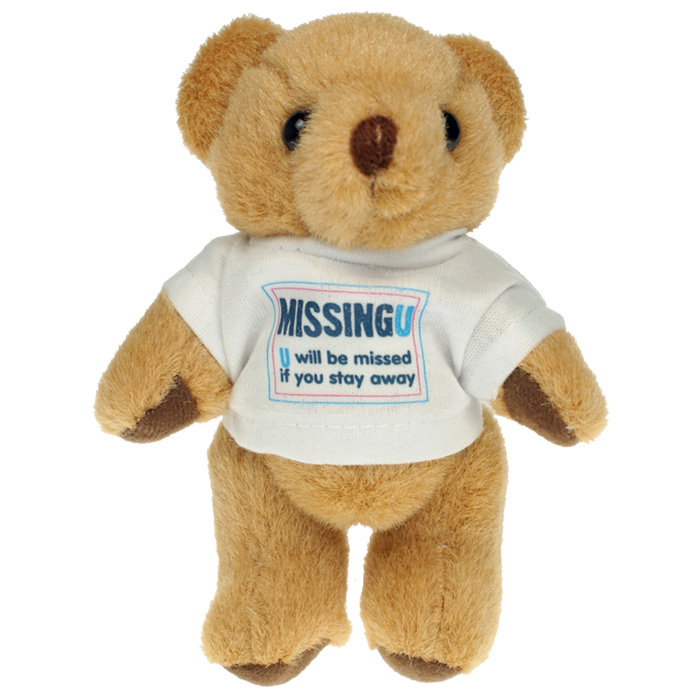 Each bear arrives wearing a white t-shirt which can be printed in fabulous full colour. Honey bears are also available with a variety of different accessories and alternative sizes. 1 Day service available on ordersand artwork received by 11am - subject to sight of your artwork. Our express art service applies to setting text, working with ‘vectored’ art files and reorders (where we hold your art on file). Preferred vectored art files are Adobe Acrobat pdf, Adobe Illustrator AI or EPS and Corel Draw (please convert text to outlines). Please approve your proof by 2pm so that we can dispatch your order the following working day. An order placed by 11am on Monday would be dispatched on Tuesday provided that your artwork proof is approved by 2pm on Monday. Our express service applies to a 1 colour print to the barrel of the pen up to 1000 units; for a higher quantity or for multi-colour designs please see the standard listing for this item. Price includes a full colour print to the t-shirt. Print area: 35 x 25mm.